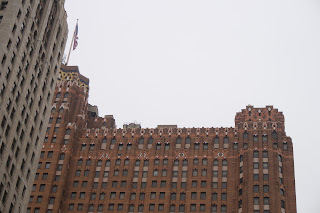 Teza Lwin: Detroit: December 12, 2015; Motown! 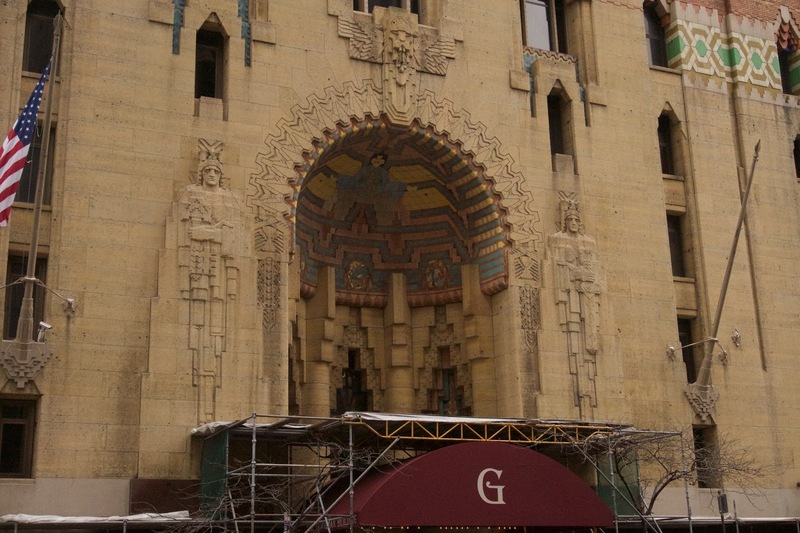 The Guardian Building! Detroit: December 12, 2015; Motown! 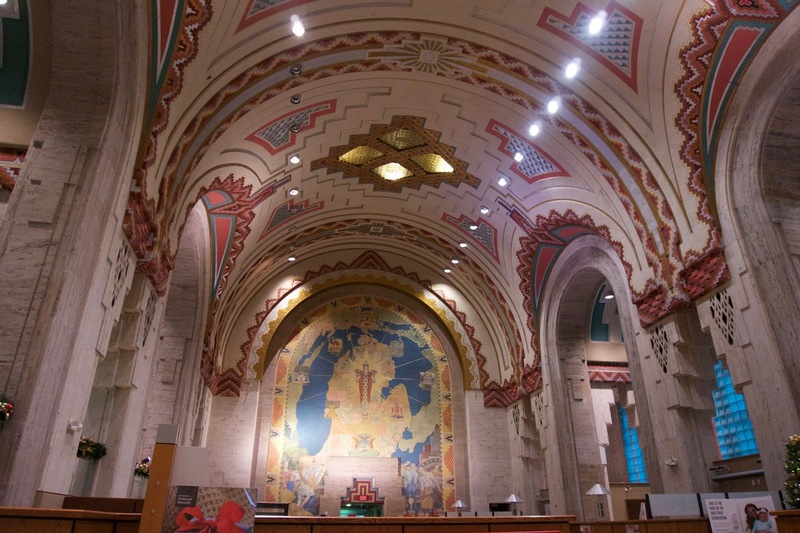 The Guardian Building! Detroit, y'all. Motor City. Motown, etc. Still a warm day in southern Ontario, but excited to be re-visiting a city that I've come to love. Beautiful downtown and pretty affordable. Click on the photos to enlarge, of course. A view of Detroit from across the river in Windsor, Saturday December 12, 2015--using the panorama setting on my camera--oh, for a fish lens. 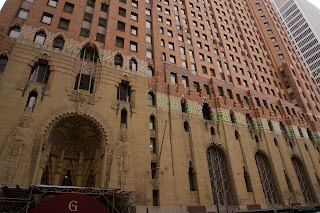 Detroit has been going through rough economic times for as long as I recall, I think partly because of that, these beautiful art deco skyscrapers have continued to stand. In other cities, where real estate was worth something, someone might have torn these down to build other buildings--bigger and taller. This is, in my opinion, one of the most beautiful. 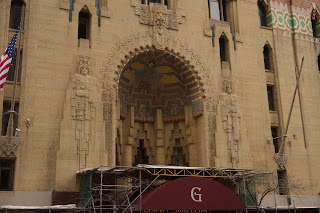 This is the exterior of the Guardian Building. 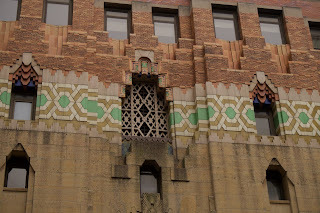 Detail of the exterior of the Guardian Building, Detroit. December 12, 2015. The exterior is limestone and brick. Detail of the exterior of the Guardian Building, Detroit. I just like the pattern in the decortation, and the weird shape around the windows. December 12, 2015. 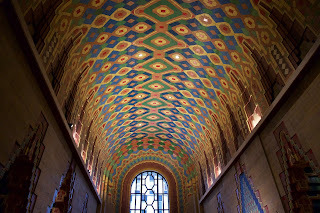 Top of the Guardian Building, Detroit, December 12, 2015. 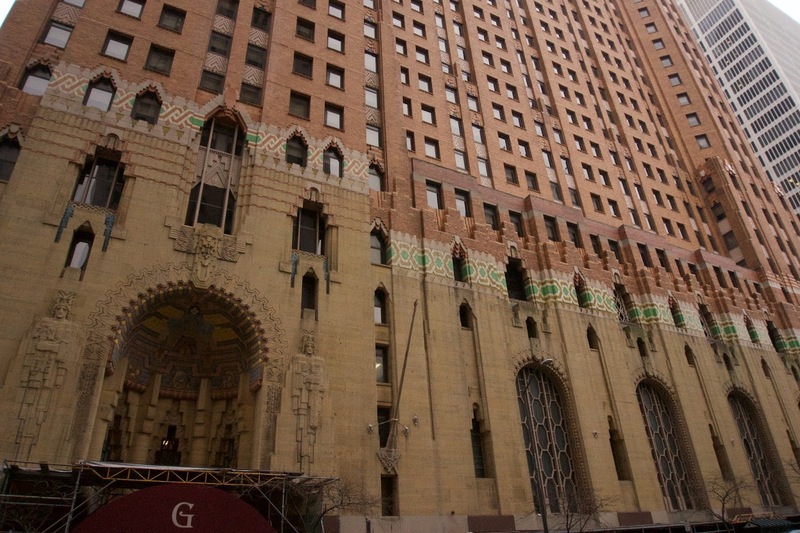 The Guardian Building is 36 stories, with two spires. The interior of the building is fantastic, and is an art deco wonderland!! 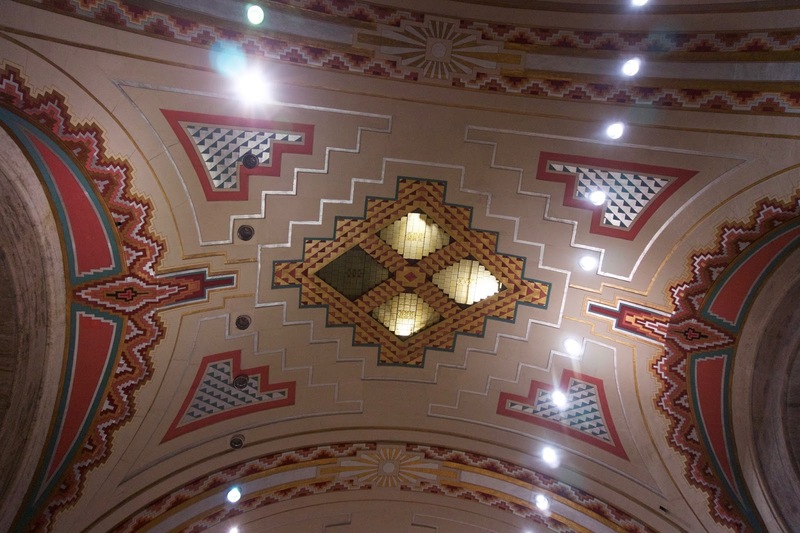 Upon entering the building, this is the ceiling in the entrance way, where a lone security guard sits. 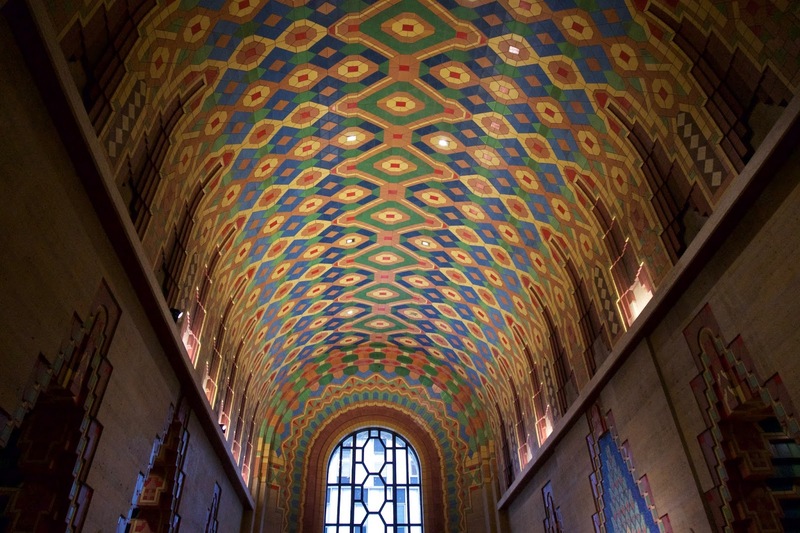 Interior of the Guardian Building, Detroit. December 12, 2015. 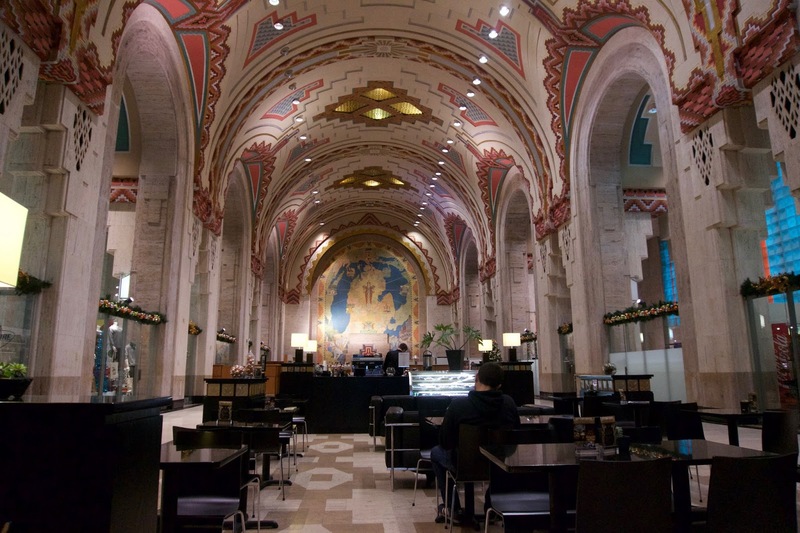 The Rowland Cafe in the main atrium of the Guardian Building, Detroit. December 12, 2015. The atrium is decorated with tiling and houses a few tenants, mainly the Rowland Cafe and, to the left in the above picture, a Detroit gift / souvenir shop. There's a Bank of America Branch in the back of the atrium, just in front of the "mural" on the back wall. 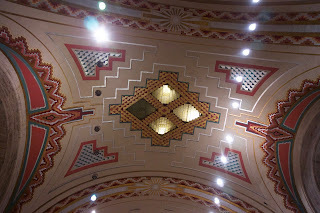 Arches and ceiling in the Guardian Building, Detroit. December 12, 2015. Outside the Guardian Building, Detroit. December 12, 2015. You can also see the people mover in the photo, which is mass transit for Detroit, but seems to be empty when I'm in Detroit. It might be because I'm in Detroit on weekends. I like that this view seem sto be a living concept of what people in the 20s and 30s thought it might be like in the "far future" of the 80s and 90s, with brick buildings, and elevated railways, etc. 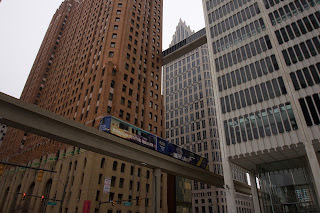 Something in Detroit seems to have changed, though, since I started visiting. The last two times I visited the Guardian Building, it was empty except for the security guard in the lobby and the person working in the Rowland Cafe in the atrium. This time, while I was sitting in the Guardian Building, so many other people were visiting the building and taking photos. Maybe the long-rumoured Detroit Renaissance is actually happening?? ?